What’s the obsession with off-piste? That’s something I always wondered when I first started out. I mean, the trails at most centres are decent and they’re usually well maintained. The off-piste stuff that I’d seen looked more thrown together than cared for and instantly I was put off riding it. Eventually, my mindset started to change. Most local trail centres were subject to a visit at least once a month and the relatively small number of choices around me meant that I was beginning to get bored of riding the same trails over and over. Travelling further and further meant that I’d end up spending more time driving in the car than actually riding; not brilliant. The answer to this problem didn’t initially come from an off-piste ride, though – it actually came from a bridleway route. The Rosedale Ramble route, recommended by Pedal North, became an opportunity to ride something a little different. The allure of the apparently amazing singletrack was what originally drew me in, but I’ve still yet to sample it. After some mis-following of the directions, after a short stop at the Lion Inn at Blakey Ridge, the singletrack was put on hold and I made a quick return to the car before the November darkness crept in. Nevertheless, it got me in the mood for some adventure. 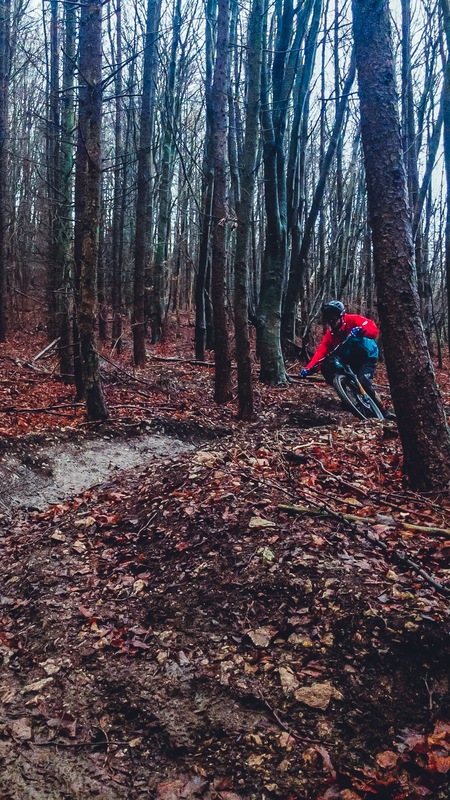 That feeling of being away from the trails – away from other riders all doing the same thing – was enough to spark an interest in finding and riding some off-piste routes at trail centres. Somehow, the romantic thought of getting out onto trails that not everyone knows about filled my head. A trip to Sherwood Pines off-piste was enough to cement that. Some of the No Name Syndicate lot showed me round and we sessioned some fun sections which actually made the trip out to the trail centre worth it. Sherwood Pines is definitely not my cup of tea. It’s got so little elevation that the vast majority seems like you’re on the pedals or there’s no flow. Great if you want a workout; not so much if you’re looking to ride something where you can point the bike down and hold on. Away from the beaten track was a lot more fun though, even if it was only in a few places. The real obsession came when Pete Rees showed a few of us a small sample of the Dalby off-piste. Pete is a brilliant bloke as well as a pretty handy rider. He had no problem showing the rest of us up on the bike – putting down the pace and sending some decent jumps which were just not within anyone else’s capabilities. His trail dog was almost a better rider than him too! Thanks to Pete, I’d got a notion of where I could find some of the more technical riding I’d heard about in Dalby; something a bit different to the classic cross-country routes it’s become known for. The notion that off-piste was simply badly built, unsanctioned trails also disappeared after a good explore. 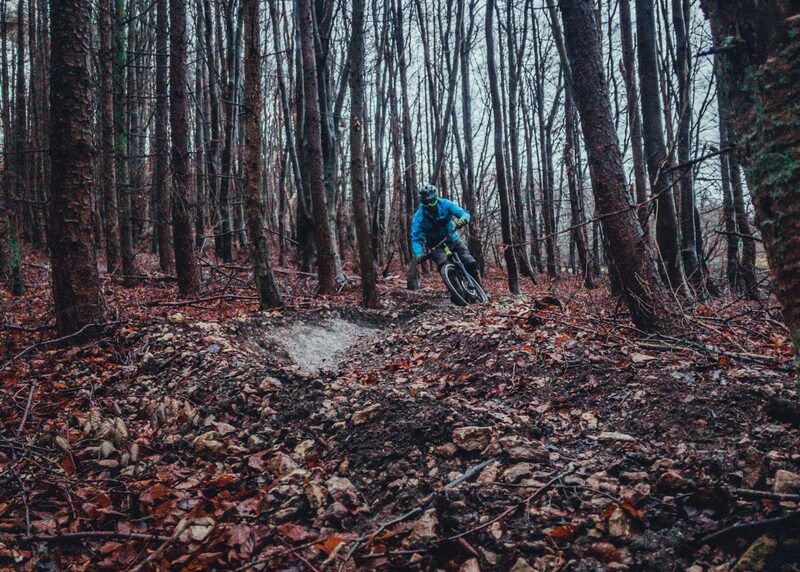 Instead, I found great, technical riding making use of the steeper sections of the forest. The trails are well built and ride superbly, even if the drainage isn’t as sussed as the sanctioned stuff. Granted, they’re not so connected as a trail centre loop would be, but they are quality and they give that sense of adventure too. For me, trail centre and off-piste riding now go hand in hand. I’ll always try a place’s trails first and follow a way marked route. It’s easier to navigate, usually safer to ride and doesn’t rely on local knowledge. However, off-piste riding has brought freshness to some of the more local places I know and I’m really grateful for that.